When I entered "Pi E2" in the Chattanooga AQS QuiltWeek show last year, I received an e-mail saying they were going to use "Pi" in future promotional materials for their shows. Exciting! I came across this e-mail blast last night. this AQS QuiltWeek e-mail promotion. Reversed out in the turquoise blue bar across the top in white print is the credit with the name of the quilt and my name, "Detail: "Pi E2 [Exponentially Embellished] by Veronica Hofman-Ortega." To see the full ad, here is the web page link. The original story about appliquéing, piecing and quilting this quilt (including thread stats) is in this 2013 post. It was accepted in the Georgia Sewing and Quilt Expo in 2013. It was juried into and won a 3rd prize at the HMQS—Home Machine Quilting Show in 2014. 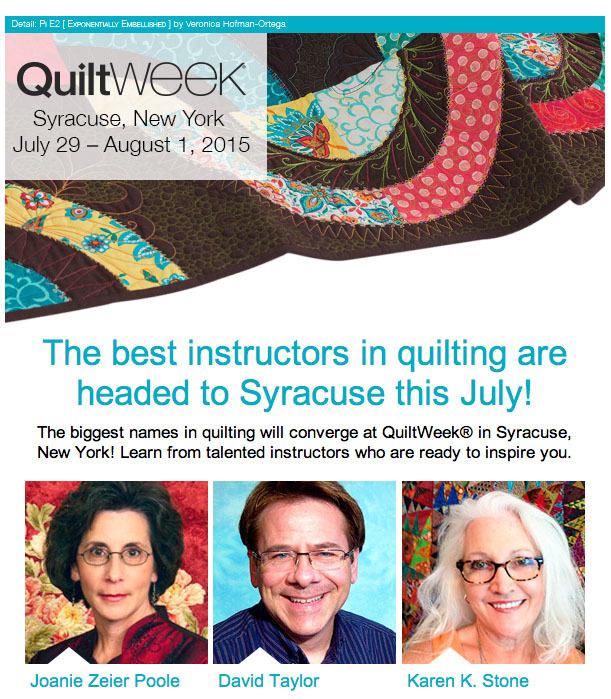 Last fall, it was accepted into AQS Chattanooga and now it is promoting upcoming AQS shows in 2015. "Pi" has been a busy little quilt.